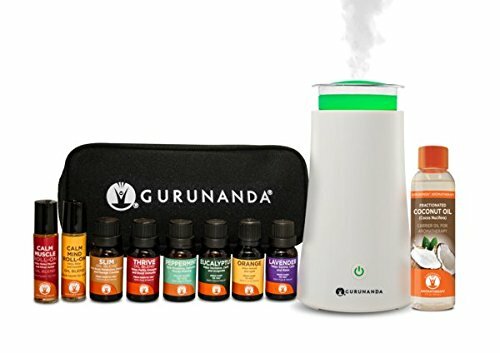 GuruNanda Portable White Essential Oil Diffuser for Car, Home, Office ~ Aromatherapy Ultrasonic Mist Essential Oils Diffusers ~ Travel-Size, Humidifiers, Fits in Cup Holder! The GuruNanda USB Car Diffuser is an easy-to-use, high quality 55 ml essential oil diffuser for cars, utilizing a USB port as a source of power for the mist, lasting up to 8 hours. 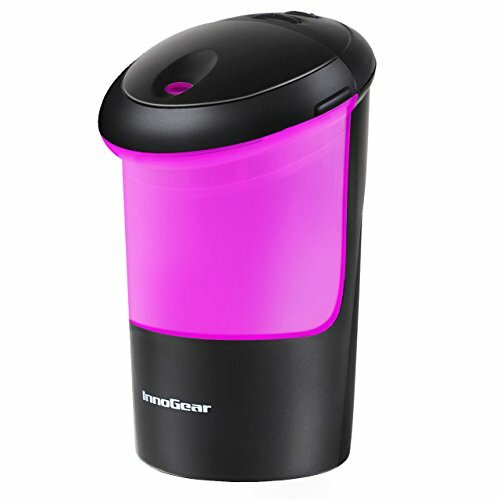 Our unique USB Car Diffuser uses ultrasonic technology to diffuse distilled water and essential oils without generating heat so that the properties and qualities of the essential oil are neither damaged nor compromised. To Enjoy Natural Aromatherapy In The Car, Simply Fill The Tank With Distilled Water and Then Add a Few Drops Of Your Favorite Pure & Natural Essential Oils Such As Lavender, Rosemary, Lemongrass, Peppermint and Eucalyptus! 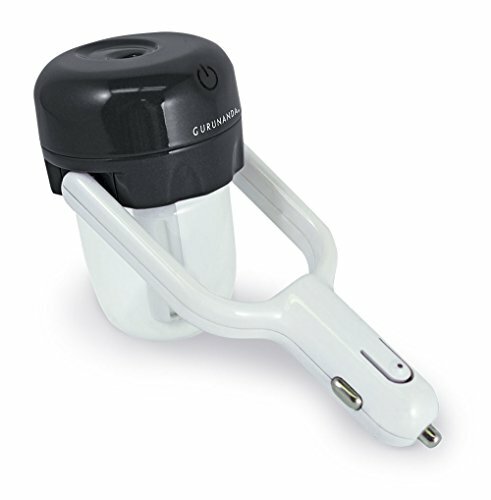 With modern and innovative design, the GuruNanda USB Car Diffuser can be easily fit in the cup-holder of any car. Try our Gurunanda USB Car Diffuser today and start breathing fresh healthy air while in the car. The experience will be refreshing. 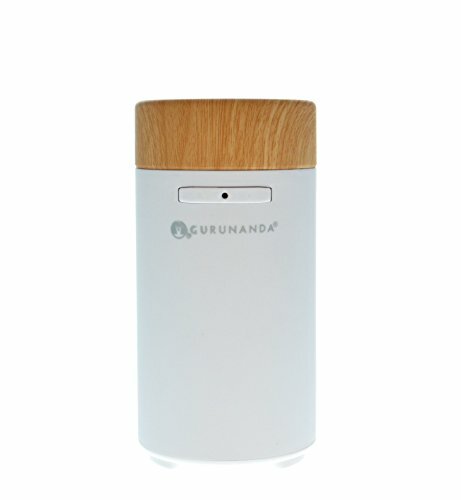 Waterless Aromatherapy: GuruNanda waterless technology means you don't have to deal with the messy hassle of filling your aroma diffuser with water. Easy to Use: Fit it, Plug it, Mist it. It only takes three steps to get you into an aromatic paradise. 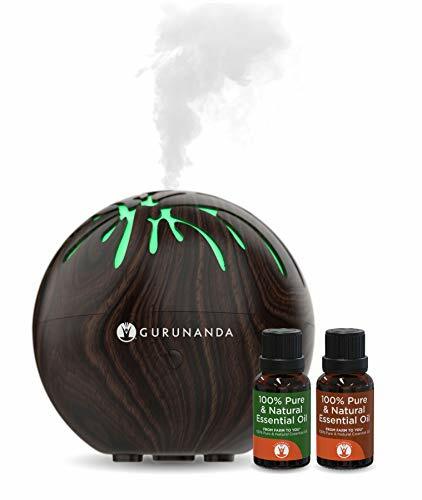 Therapeutic: Diffuse your favorite GuruNanda essential oils such as Peppermint, Cedarwood, Orange, Lavender, Eucalyptus, Rosemary, Lemongrass, Frankincense, and Lemon. Diffuse with the Natural Mist to help improve breathing, promote immunity, and relax the mind. 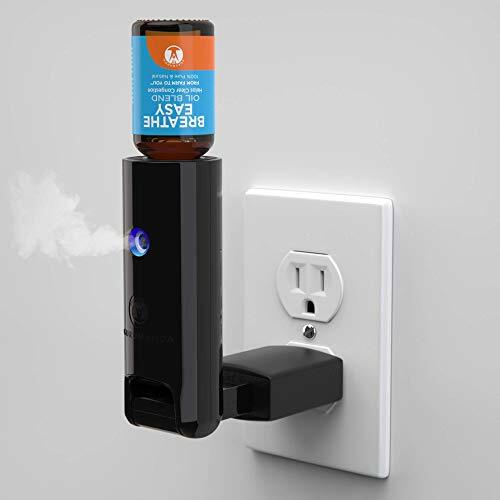 USB Compatible: The Natural Mist Pluggy is easy to transport and can be plugged into most devices with a USB outlet as well as directly into the wall with the included adaptor. Quiet Operation: The Pluggy will provide you with beautiful aromas and therapeutic effects all while operating at a whisper-quiet volume. Comes with 2 bonus essential oils!! Mini Tree- The GuruNanda Ultrasonic aromatherapy USB Essential Oil Diffuser is an ideal way to add moist, comfortable air to small bedrooms, hotel rooms, tabletops and even workplace cubicles. Fight back against dry air. This stylish cool mist humidifier adds moisture to your air to eliminate dryness and help with your dry chapped skin, chapped lips and dry sinuses. Add a drop of your favorite GuruNanda essential oil to give your room a pleasant scent. USB Diffuser - Perfect diffuser to plug into your laptop to receive the benefits of aromatherapy while working on your computer. Great gift for anyone at the office. Eucalyptus Essential Oil may help with congestion with this natural aid. Need to clear your mind, Eucalyptus helps you calm both the mind and body naturally. It is an excellent essential oil to assist with daily stress or a hectic work day. Use Eucalyptus and you will remain productive for longer periods of time. Eucalyptus provides energy for the coming day, and works against difficulty breathing. SUPERIOR ingredients: Eucalyptus Essential Oil is made with 100 Percent Pure and Natural Eucalyptus (Eucalyptus globulus) Add 4-5 drops to a diffuser and enjoy. If you are not ABSOLUTELY amazed, receive a full refund, no questions asked! Blends well with Cedarwood Essential Oil, Lemon Essential Oil, Rosemary Essential Oil, and Lavender Essential Oil. PURE + RIGOROUS QUALITY TESTING & CONTROLS: 3rd Party GCMS Tested (see PDF labeled Specification sheet below), Verified & Certified 100% PURE & NATURAL. Make sure ALL oils you buy have these qualifications. 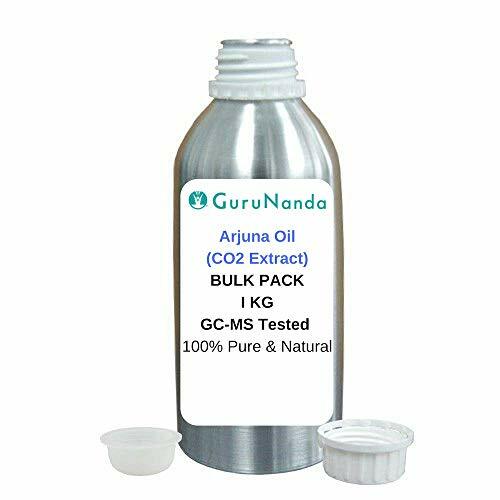 In our opinion our oil is THE MOST RARE, BEST SMELLING, AND MOST THERAPEUTICALLY EFFECTIVE OF ALL, GuruNanda Eucalyptus Essential Oil is produced using plants and flora grown in the best possible place on earth which ensures that it will have the highest therapeutic content possible. Amazing Quality at Wholesale Prices: GuruNanda is SUPERIOR because we work directly with the farmers ensuring Unadulterated Quality with Unbeatable Prices. 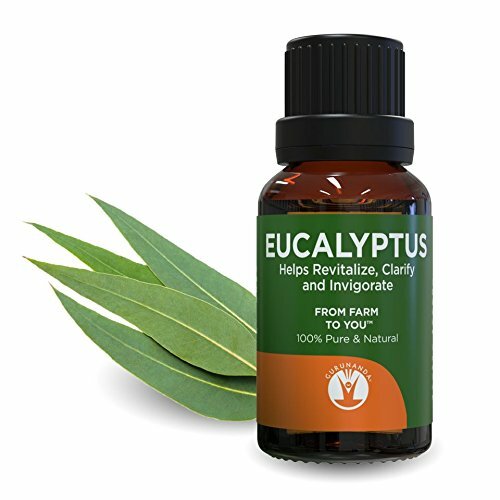 COMPARE-n-SAVE: Eucalyptus Essential Oil is far less expensive and its quality and therapeutic value have a Satisfaction Guaranteed!! 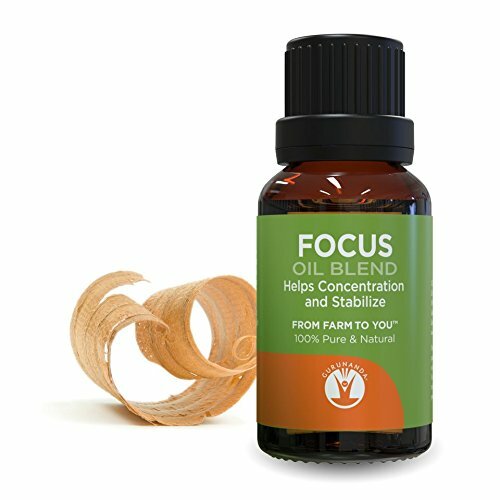 SUPERIOR ingredients: FOCUS Essential Oils Blend is made with Cedarwood Essential Oil, Orange Essential Oil, Rosemary Essential Oil, Lemon Essential Oil, and Basil Essential Oil. Add 4-5 drops to a diffuser and enjoy. If you are not ABSOLUTELY amazed, receive a full refund, no questions asked! PURE + RIGOROUS QUALITY TESTING & CONTROLS: 3rd Party GCMS Tested (see PDF labeled Specification sheet below), Verified & Certified 100% PURE & NATURAL. Make sure ALL oils you buy have these qualifications. 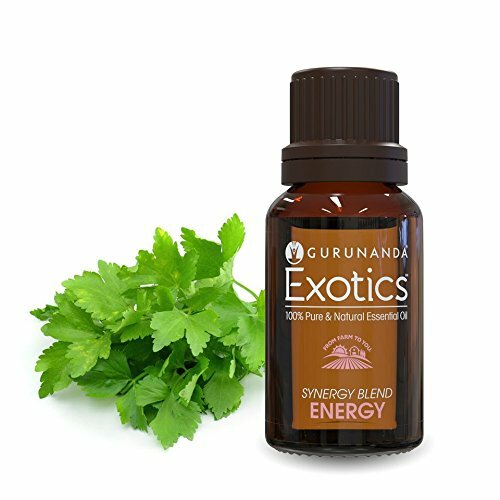 In our opinion our oil is THE MOST RARE, BEST SMELLING, AND MOST THERAPEUTICALLY EFFECTIVE OF ALL, GuruNanda FOCUS Blend is produced using plants and flora grown in the best possible place on earth which ensures that it will have the highest therapeutic content possible. COMPARE-n-SAVE: FOCUS Blend is far less expensive and its quality and therapeutic value have a Satisfaction Guaranteed! !COMPARE-n-SAVE: FOCUS Blend is far less expensive and its quality and therapeutic value have a Satisfaction Guaranteed!! INGREDIENTS: Certified 100% Pure and Natural Essential Oils Blend - Peppermint (Mentha piperita) - Black Pepper (Piper nigrum) - Turmeric (Curcumalonga root) - Ginger (Zingiber officinale) - Cumin (Cuminum cyminum) - Nutmeg (Myristica fragrans kernel) - Fenugreek (Trigonella foenum graceum) - Lemon (Citrus limon) - Coriander (Coriandrum sativum) |Guaranteed NO Fillers, NO Additives, NO Bases, NO Carriers, and NO Adulterants of any kind. We source our farms where the plants are indigenously grown. This ensures the greatest therapeutic strength. COMPARE-n-SAVE: Energy Synergy Blend is far less expensive and its quality and therapeutic value have a Satisfaction Guarantee!! GuruNanda offers a 100% Satisfaction Guarantee. We can offer a satisfaction guarantee because of our rigorous quality control. Every oil is gcms tested for quality and purity. We test every batch in house and with an independent 3rd party laboratory. We do this because our customers deserve the highest quality oils. NGREDIENTS: 100% Pure and Natural Petitgrain - Citrus aurantium ssp. amara | All of GuruNanda Essential Oils are Certified 100% Pure - Guaranteed NO Fillers, NO Additives, NO Bases, NO Carriers, and NO Adulterants of any kind. ORIGIN: Paraguay - Mexico - Peru | We source our farms where the plants are indigenously grown. This ensures the greatest therapeutic strength. 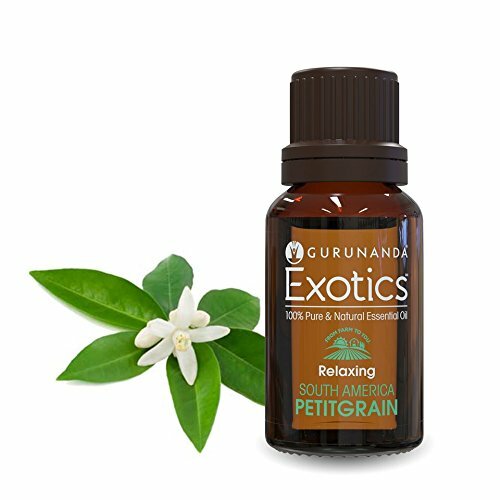 THERAPEUTIC PROPERTIES: Relaxing - Balancing - Deodorizing - Calming | Petitgrain essential oil is known for its calming effects perfect for massage and its ability to support a healthy immune system. AROMA: Fresh Floral Herbaceous | Petitgrain is known for its Fresh aroma that encourages sleep, stimulates dreams, and has traditionally been used as a main ingredient in the perfume industry. Our uplifting Exotic Marjoram Essential Oil is extracted from Egypt and provides a Spicy, Woody, and Minty aroma which has a variety of therapeutic benefits. Benefits of our Marjoram Essential Oil also known as Origanum Majorana are that it Improves breathing, cleanses ones environment, relaxes the mind and body. Pure and Natural - with Nothing Added, Nothing Removed. Our promise is to bring only the highest quality essential oils to our customers. Always Pure - Always Natural! 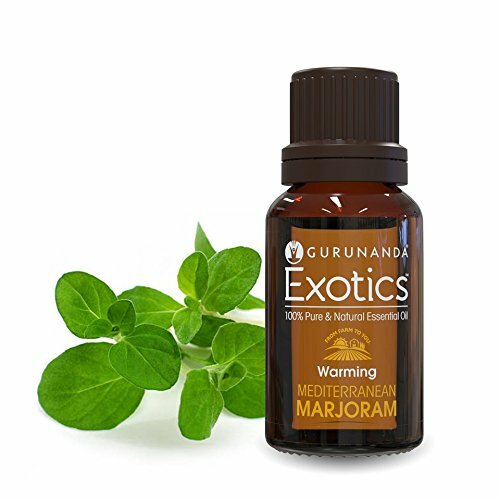 Our Exotic Marjoram Essential Oil which originates from Egypt can be used with your favorite GuruNanda diffusers or mixed with your favorite GuruNanda carrier oil. Apply a few drops of the diluted essential oil to wrists, temples, back of the neck or bottom of feet to enjoy the benefits. Pure + Rigorous Quality Testing and Control: 3rd Party GCMS Tested, Verified & Certified 100% Pure & Natural. Try GuruNanda Therapeutic Grade Oils if you've appreciated products by ArtNaturals, doTERRA, Radha Beauty, Natrogix, Majestic Pure, Lagunamoon, Artizen, Healing Solutions, or Plant Therapy. 2 Essential Oil Roll Ons: Calm Muscle Essential Oil Roll On and Calm Mind Essential Oil Roll On - GuruNanda Roll Ons are easy to use and pre mixed with Sweet Almond Carrier Oil for topical application. Simply apply to your desired area and feel the effects immediately. 1 Fractionated Coconut Carrier Oil: This carrier oil has a wide range of uses including Massage Oil | Hair Strengthener | Skin Moisturizer | Aromatherapy DIY Projects | Beauty Regiments. GuruNanda only uses the highest quality Fractionated Coconut Oil. Guranteed 100% Pure and Natural. Essential Oil Storage Bag - Holds 12 Essential Oils: Every Aromatherapist or Essential Oil Aficionado needs a convenient Essential Oil carry bag. While on the go or at home keep your essential oils organized.